For the modern Greek currency, see the Ionian obol; for the British currency, see the halfpenny; for the brachiopod genus, see Obolidae. Not to be confused with Obelus. LUCANIA, Metapontion. 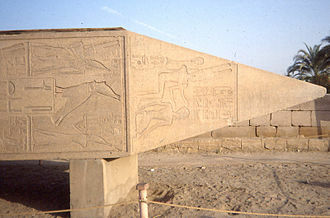 c. 425-350 BC. Æ 21 mm. A 19th-century obol from the British-occupied Ionian Islands. 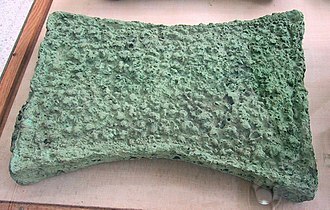 Obols were used from early times. According to Plutarch they were originally spits of copper or bronze traded by weight, while six obols make a drachma or a handful, since that was as many as the hand could grasp. 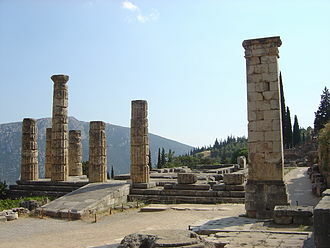 Heraklides of Pontus in his work on "Etymologies" mentions the obols of Heraion and derives the origin of obolos from obelos. This is confirmed by the historian Ephorus on his work "On Inventions". Excavations at Argos discovered several dozen of these early obols, dated well before 800 BC; they are now displayed at the Numismatic Museum of Athens. Archaeologists today describe the iron spits as "utensil-money" since excavated hoards indicate that during the Late Geometric period they were exchanged in handfuls (drachmae) of six spits, they were not used for manufacturing artifacts as metallurgical analyses suggest, but they were most likely used as token-money. 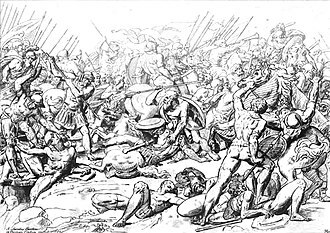 Plutarch states the Spartans had an iron obol of four coppers. They retained the cumbersome and impractical bars rather than proper coins to discourage the pursuit of wealth. In Classical Athens, obols were traded as silver coins. 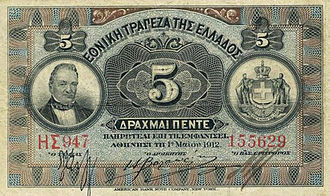 Six obols made up the drachma. There were also coins worth two obols ("diobol") and three obols ("triobol"). Each obol was divisible into eight "coppers" (χαλκοί, khalkoí). 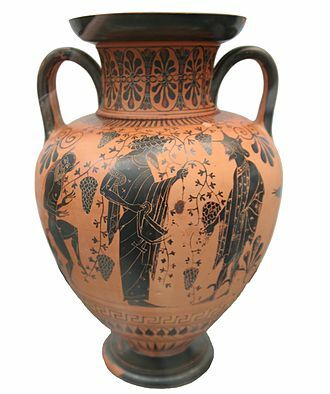 During this era, an obol purchased a kantharos and chous (6 pints or 3 liters) of wine. Three obols was a standard rate for prostitutes. The deceased were buried with an obol placed in the mouth of the corpse, so that—once a deceased's shade reached Hades—they would be able to pay Charon for passage across the river Acheron or Styx. Legend had it that those without enough wealth or whose friends refused to follow proper burial rites were forced to wander the banks of the river for one hundred years. The obol or obolus was also a measurement of Greek, Roman, and apothecaries' weight. In ancient Greece, it was generally reckoned as ​1⁄6 drachma (c. 0.72 grams (0.025 oz)). Under Roman rule, it was defined as ​1⁄48 of a Roman ounce or about 0.57 grams (0.020 oz). The apothecaries' system also reckoned the obol or obolus as ​1⁄48 ounce or ​1⁄2 scruple. 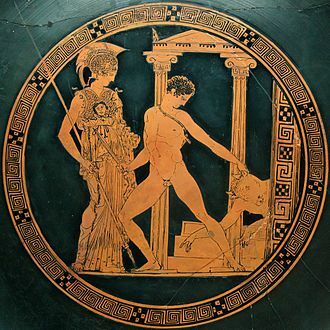 The obolus, along with the mirror, was a symbol of new schismatic heretics in the short story "The Theologians" by Argentine author Jorge Luis Borges. In the story's discussion of the circularity of time, eternity, and the transmigration of the soul through several bodies the author uses a quote of Luke 12:59, mistranslated as "no one will be released from prison until he has paid the last obolus" since Luke calls the coin a lepton (a somewhat smaller denomination) rather than an obolus. ^ ὀβολός. Liddell, Henry George; Scott, Robert; A Greek–English Lexicon at the Perseus Project. ^ Biba Teržan "L'aristocrazia femminile nella prima età del Ferro"
^ Davidson, James (1998). Courtesans and Fishcakes: The Consuming Passions of Classical Athens. London: Fontana Press. p. 59. ISBN 0-00-686343-4. ^ Oxford English Dictionary. "obol, n."
^ Oxford English Dictionary. "obolus, n."
^ Sayles, Wayne G. (1997). Ancient coin collecting 3. Iola: Krause Publications. p. 19. ISBN 0-87341-533-7. ^ a b Borges, Jorge Luis (1962). Labyrinths. New York: New Directions Publishing Corporation. pp. 122–24. ISBN 978-0-8112-0012-7. Wikimedia Commons has media related to Obol. The Acheron is a river located in the Epirus region of northwest Greece. Its source is near the village Zotiko, in the part of the Ioannina regional unit it flows into the Ionian Sea in Ammoudia. In ancient Greek mythology, Acheron was known as the river of woe, in the Homeric poems the Acheron was described as a river of Hades, into which Cocytus and Phlegethon both flowed. The Roman poet Virgil called it the river of Tartarus, from which the Styx. The newly dead would be ferried across the Acheron by Charon in order to enter the Underworld, the Suda describes the river as a place of healing, not a place of punishment and purging the sins of humans. 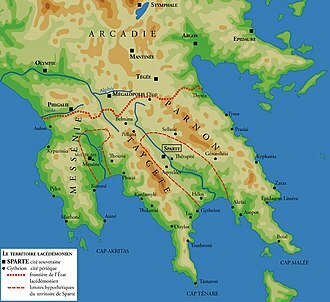 By this myth, Acheron is the father of Ascalaphus by either Orphne or Gorgyra, the river called Acheron with the nearby ruins of the Necromanteion is found near Parga on the mainland opposite Corfu. 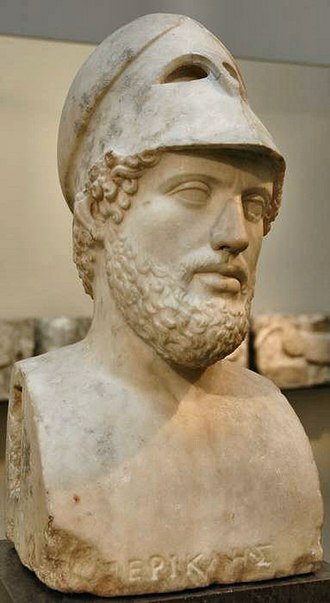 Another branch of Acheron was believed to surface at the Acherusian cape and was seen by the Argonauts according to Apollonius of Rhodes, greeks who settled in Italy identified the Acherusian lake into which Acheron flowed with Lake Avernus. The British pre-decimal halfpenny coin, usually simply known as a halfpenny, was a unit of currency that equalled half of a penny or 1/480th of a pound sterling. Originally the halfpenny was minted in copper, but after 1860 it was minted in bronze and it ceased to be legal tender in 1969, in the run-up to decimalisation. The halfpenny featured two different designs on its reverse during its years in circulation, from 1672 until 1936 the image of Britannia appeared on the reverse, and from 1937 onwards the image of the Golden Hind appeared. Like all British coinage, it bore the portrait of the monarch on the obverse, halfpenny was colloquially written ha’penny, and 1½d was spoken as a penny ha’penny /əˈpɛniˈheɪpni/ or three hapence /θriːˈheɪpəns/. Before Decimal Day in 1971 there were 240 pence in one pound sterling, twelve pence made a shilling, and twenty shillings made a pound. Values of less than a shilling were simply written in pence, the original reverse of the bronze version of the coin, designed by Leonard Charles Wyon, is a seated Britannia, holding a trident, with the words HALF PENNY to either side. Issues before 1895 feature a lighthouse to Britannias left and a ship to her right, various minor adjustments to the level of the sea depicted around Britannia, and the angle of her trident were made over the years. Some issues feature toothed edges, while others feature beading, over the years, various different obverses were used. Edward VII, George V, George VI and Elizabeth II each had a single obverse for halfpennies produced during their respective reigns. Over the long reign of Queen Victoria two different obverses were used, but the reign of Edward VIII meant no halfpennies bearing his likeness were ever issued. During Victoria’s reign, the halfpenny was first issued with the so-called ‘bun head’, the inscription around the bust read VICTORIA D G BRITT REG F D. This was replaced in 1895 by the ‘old head’, or ‘veiled bust’, the inscription on these coins read VICTORIA DEI GRA BRITT REGINA FID DEF IND IMP. Coins issued during the reign of Edward VII feature his likeness, those issued during the reign of George V feature his likeness and bear the inscription GEORGIVS V DEI GRA BRITT OMN REX FID DEF IND IMP. Charons obol is an allusive term for the coin placed in or on the mouth of a dead person before burial. Archaeological examples of coins, of various denominations in practice, have been called the most famous grave goods from antiquity. 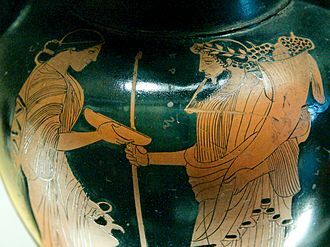 The custom is associated with the ancient Greeks and Romans. Although archaeology shows that the myth reflects an actual custom, the placement of coins with the dead was neither pervasive nor confined to a coin in the deceaseds mouth. In many burials, inscribed metal-leaf tablets or exonumia take the place of the coin, the presence of coins or a coin-hoard in Germanic ship-burials suggests an analogous concept. The coin for Charon is conventionally referred to in Greek literature as an obolos, one of the denominations of ancient Greek coinage. Among the Greeks, coins in actual burials are a danakē or other relatively small-denomination gold, silver. In Roman literary sources the coin is usually bronze or copper, the word naulon is defined by the Christian-era lexicographer Hesychius of Alexandria as the coin put into the mouth of the dead, one of the meanings of danakē is given as the obol for the dead. In Latin, Charon’s obol is sometimes called a viaticum, which in everyday usage means provision for a journey, encompassing food and other supplies. The same word can refer to the allowance granted to those stripped of their property and condemned to exile. The earliest literary evidence of this Christian usage for viaticum appears in Paulinus’s account of the death of Saint Ambrose in 397 AD, thomas Aquinas explained the term as a prefiguration of the fruit of God, which will be in the promised land. 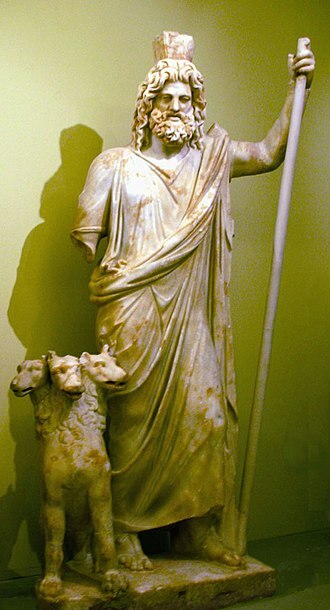 Greek epigrams that were literary versions of epitaphs refer to the obol that pays the passage of the departed, the satirist Lucian has Charon himself, in a dialogue of the same name, declare that he collects an obol from everyone who makes the downward journey. In an elegy of consolation spoken in the person of the dead woman, several other authors mention the fee. Humor, as in Aristophanes’s comic catabasis The Frogs, makes the journey to Hades less frightening by articulating it explicitly and trivializing it.